Don't miss our special events and promotions for this holiday season! He's making a list and checking it twice! Young and old alike - come see Santa and Mrs. Claus at Jarrettsville Nurseries on Black Friday (opening day) and Saturdays and Sundays from 11am - 4 pm. Jarrettsville Nurseries is proud to support The Chesapeake Cancer Alliance (CCA) that funds the Kaufman Cancer Center and Cancer LifeNet at the University of Maryland Upper Chesapeake Health. This charity is near and dear to our heart as a business because of our own late Boyd Saulsbury's battle with cancer in 2015. The programs at Cancer LifeNet gave the Boyd family the strength and support when they needed it most. 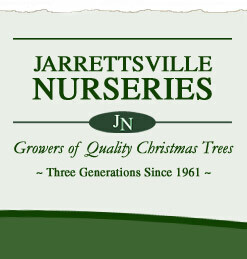 Jarrettsville Nurseries will be donating the wreaths that will be available for sale at this year's event. Proceeds from the event support cancer care, right here in our community. Click here to get a $2 OFF coupon to the Festival of Trees event. Jarrettsville Nurseries will be donating 50 cents per wreath sold this year to the Desmoid Tumor Research Foundation (DTRF). The mission of DTRF is to aggressively fund research to accelerate the development of improved therapies, and ultimately find a cure for desmoid tumors. The organization collaborates with dedicated researchers and clinicians worldwide to improve the lives of patients through education, awareness and support. DTRF's founders have a deep sense of urgency in this cause motivated by a personal connection to the disease. DTRF is the only foundation in the world solely dedicated to funding desmoid tumor research and finding a cure for this rare disease. The organization funds research projects at the world's top sarcoma cancer research centers in both basic science and clinical trials. DTRF-funded research seeks to determine what goes wrong in cells to generate these tumors, what medical and surgical options work best, and what existing drugs or potential new drugs could provide effective treatments. DTRF facilitates collaboration between researchers from different institutions to expedite the development of a cure. DTRF-funded research has already made significant advancements in our understanding of the disease. Discoveries made through desmoid tumor research can also potentially be applied to many other kinds of cancers such as breast, colon, ovarian and other sarcoma cancers. Our own Amanda has been a desmoid tumor survivor since 2014. Jarrettsville Nurseries has been a supporter in her fight to bring awareness to this rare disease and to help find a cure. In honor of Amanda, we will be donating 50 cents per wreath sold this year to DTRF.